Read Next: Google Pixel 3 XL vs Google Pixel XL – Is it worth the upgrade? However, the Google Pixel 3 XL is the latest smartphone from Google itself, the emperor of Android. It has many of the features the 6T has and then some. It starts at a whopping $900, going all the way as high as $1,000 for the variant with 128GB of storage. Let’s see what happens when we put the two devices up against each other in this OnePlus 6T vs. Google Pixel 3 XL comparison. The OnePlus 6T and Google Pixel 3 XL are mostly made of the same material: glass. On the back, the Pixel 3 XL has a two-tone design, similar to the Google Pixel 2, though it’s only one slab of glass across the whole back this time. With the OnePlus 6T, you can choose between the mirror black finish and midnight black finishes. Mirror black (shown in the photos attached to this article) is slick and shiny — a dust and fingerprint magnet. Midnight black has more of a matte feel, similar to the back of the Google Pixel 3 XL. Both devices are very curvy, with rounded corners on the hardware and display. Holding each was a similar experience, so much so sometimes I forgot which one was in which hand. The Pixel 3 XL has a two-tone back design and isn't a dust and fingerprint magnet like the OnePlus 6T. The OnePlus 6T is slightly thicker than the Google Pixel 3 XL, and when you’re holding both the thickness can be noticeable. However, the discrepancy is not so much that the 6T ends up feeling chunky — it’s just got a little more heft to it. The two devices are very close in design, but the Pixel 3 XL wins out in this round, if only because its finish attracts dust and fingerprints less. If you keep your device in a case 24/7, this is a moot point. If you don’t, you’ll rub the back of the Pixel 3 XL on your shirt fewer times per day than the OnePlus 6T. As far as resolution goes, the Google Pixel 3 XL has the superior display pitted against the OnePlus 6T. However, display resolution isn’t everything, and the OnePlus 6T is better in other ways. The Pixel 3 XL has a 6.3-inch flexible OLED panel, with a resolution of 2,960 x 1,440 in an 18.5:9 aspect ratio. The display is covered in Corning Gorilla Glass 5, with a huge notch at the top which takes up quite a bit of the screen real estate. On the other hand, the OnePlus 6T has a larger 6.41-inch AMOLED panel, with a resolution of 2,340 x 1,080 in a 19.5:9 aspect ratio. The 6T is one of the earliest devices to feature the latest Corning Gorilla Glass 6. It also has a tiny waterdrop display notch that’s barely noticeable. Display resolution isn't everything, and the OnePlus 6T offers the whole package. In real-life situations, it’s incredibly difficult to tell the difference between a 1440p display and a 1080p display, especially when you’re looking at a smartphone. Not only that, but the 1080p resolution of the OnePlus 6T is a partial reason for its long battery life (which we’ll touch on in the next section). Since the OnePlus 6T has such a small notch (and a smaller chin), you’re getting much more screen real estate as compared to the Pixel 3 XL, which is essentially the same physical size. When it comes to AMOLED vs OLED, you’ll find passionate opinions on both sides about which is better. However, it can’t be denied that AMOLED displays have a higher contrast ratio and display brighter colors than traditional OLED displays. The OnePlus 6T’s Gorilla Glass 6 is stronger and more durable than the Pixel 3 XL’s Gorilla Glass 5. According to Corning, GG6 can survive twice as many drops as GG5. 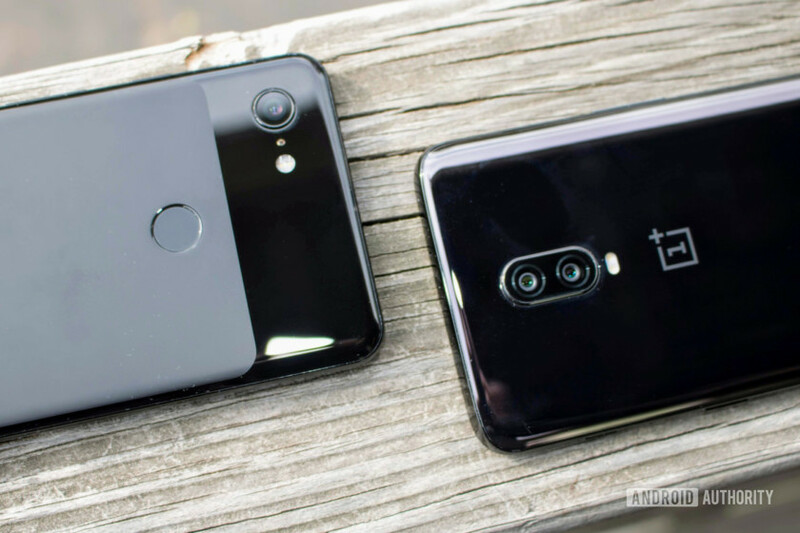 When it comes to these two smartphones, if you only care about resolution and how high the DisplayMate rating is, then you want the Google Pixel 3 XL. However, if you care more about the real-world benefits of the display such as power efficiency, high contrast levels, durability, and available screen real estate, the OnePlus 6T is the better choice. Head-to-head, the OnePlus 6T and Google Pixel 3 XL are evenly matched in processing speed. Both devices feature the latest-and-greatest Qualcomm Snapdragon 845, paired with an Adreno 630 GPU. When it comes to RAM, the OnePlus 6T mops the floor with the Google Pixel 3 XL. The lowest-end OnePlus 6T comes with 6GB of RAM and the highest-end variant comes with 8GB, while even the $1,000 variant of the Google Pixel 3 XL comes with a paltry 4GB of RAM. Google explains away this RAM discrepancy by claiming AI and software tweaks on a smartphone make 4GB of RAM perfectly adequate. However, the Pixel 3 and Pixel 3XL have faced major memory management issues since they launched, which hasn’t cast the lack of RAM in a favorable light. When it comes to memory management and battery life, the OnePlus 6T mops the floor with the Pixel 3 XL. The Snapdragon 845 is a very power-efficient chip, and both the Pixel 3 XL and the OnePlus 6T get terrific battery life, but the OnePlus 6T’s bigger battery (3,700mAh compared to the Pixel 3 XL’s 3,430mAh battery) and superior power management makes its battery life absolutely insane. Both Android Authority reviewer David Imel and I saw eight hours of screen-on time from the 6T, which clobbers the Pixel 3 XL’s battery stats. However, when your battery does run out, only one of these devices can wirelessly charge: the Pixel 3 XL. Despite both devices having fully glass backs, the OnePlus 6T doesn’t feature wireless charging. Both devices can fast charge with a wire, though. If wireless charging is non-negotiable for you, the Pixel 3 XL is what you need. If you don’t care about wireless charging, the OnePlus 6T is the clear winner of this round. For the first time in OnePlus’ history, its latest flagship device is missing a standard feature: the headphone jack. Normally, this one feature omission would be enough to make people pick the other contender in a comparison like this, but the Google Pixel 3 XL doesn’t have one, either. The OnePlus 6T has something the Pixel 3 XL doesn’t, though: an in-display fingerprint sensor. While the Google Pixel 3 XL has the standard fingerprint sensor on the back of the device, the OnePlus 6T is taking us into the future with a sensor underneath the display. The in-display fingerprint sensor on the 6T is cool and futuristic, but it is undeniable the rear sensor on the Pixel 3 XL just works better. However, the forward-thinking security tech on the OnePlus 6T is not as fast or efficient as the run-of-the-mill tech on the Pixel 3 XL. Although it is super cool to use the in-display sensor, the sensor on the Pixel 3 XL is superior in everyday use. There’s one thing that the Pixel 3 XL has that the OnePlus 6T doesn’t, and that’s an official IP rating against water and dust. While the Pixel 3 XL has an IP68 certification, the OnePlus 6T does not. If you were planning on taking your smartphone into the pool with you, your only option in this battle is the Google Pixel 3 XL. In many of the categories we’re examining, one of these devices typically has one little superiority over the other. That’s not so in this round. As with the Google Pixel and Google Pixel 2, the Google Pixel 3 is setting the industry standard for smartphone photography. If you want the best smartphone for taking photos, the Pixel 3 XL should be your top choice — or at least one of your top five. The camera on the Google Pixel 3 XL is going to be the smartphone industry standard. The OnePlus 6T can’t even compare. You can take some great shots with its rear dual camera setup, but they won’t be nearly as good as you can potentially get with the Google Pixel 3 XL. You can read more about the photography capabilities of the Pixel 3 here. Before the launch of the first Pixel smartphone, Google-branded devices featured stock Android, or very close to it. Now, Pixel devices come with an Android skin with stock-like look and a lot more features you can’t get from stock Android. The OnePlus 6T comes with the company’s own Android skin, known as OxygenOS, which itself is very stock-like, though also loaded with unique features. Ultimately, which one you like the most is going to come down to personal taste. Both the Pixel 3 XL and the OnePlus 6T launched with Android 9 Pie and will receive updates for years to come. Security patches will likely arrive on the OnePlus 6T only weeks or days after the Pixel 3 XL, so update frequency isn’t really a factor, either. Essentially, this round is a total toss-up. If the OnePlus 6T and Google Pixel 3 XL were the same price, this would be an incredibly difficult judgment call to make. However, the base model OnePlus 6T is a whopping $350 cheaper than the base model Google Pixel 3 XL. Additionally, the entry-level OnePlus 6T comes with twice the internal storage as the base model Pixel 3 XL (128GB vs. 64GB) and 2GB more RAM! If you are only voting with your wallet, the OnePlus 6T is the clear winner. However, some of you might not care about price as much as specific features. If you want an industry-best camera, wireless charging, a 1440p display, and an IP rating, the Google Pixel 3 XL is your best option. You’ll just pay through the nose for those features. If you don’t need an IP rating or wireless charging and you’re fine having a perfectly adequate camera and display resolution, there’s no need to spend $350 extra. The OnePlus 6T will give you everything you need. That’s it for our OnePlus 6T vs. Google Pixel 3 XL comparison. Do you agree with our judgments? Sound off in the comments. T-Mobile OnePlus 6T vs OnePlus 6T – what’s the difference?